Listening to Distorted Harmony’s debut, I’m reminded of an album I heard back in 2010. I’ve long held the belief that the heyday of progressive metal was back whenever Dream Theater were at their creative peak. Although almost every style of music out there takes after its flagship artists in one way or another, I found that far too many bands sought to copy without adding their own flair. Of course, your typical Dream Theater, or Symphony X clone will be armed to the brim with technical skill, but it was the emotional element that was sorely missing. In 2010, it was Haken’s “Aquarius” that opened my eyes to the ‘current’ prog metal scene’s potential. “Utopia”s blend of heartfelt melodies, warm performance, and razor- sharp compositions instantly places Distorted Harmony on the prog metal map, alongside the other promising newcomers. Though there were some infamous exceptions, I think the majority of prog metallers found themselves impressed and even touched by Haken’s “Aquarius”; it stuck within Dream Theater’s style, yet managed to create something fresh with it. I don’t mean to keep comparing Distorted Harmony with Haken, but I really do get the same impression from them. In spite of being Distorted Harmony’s first complete offering, they have already fully realized their sound in several respects. I would not be out of place calling Distorted Harmony a ‘symphonic’ progressive metal band; although they do not make a complete leap into orchestral territory, there is usually a rich symphonic arrangement backing up the band. Although this element of Distorted Harmony’s sound is programmed, it does not sound cheap or dull. In fact, listeners will be surprised to hear what a fantastic production Distorted Harmony have this first time around, although when it’s been mastered by the almighty Jens Bogren, that’s usually a sign of good things. 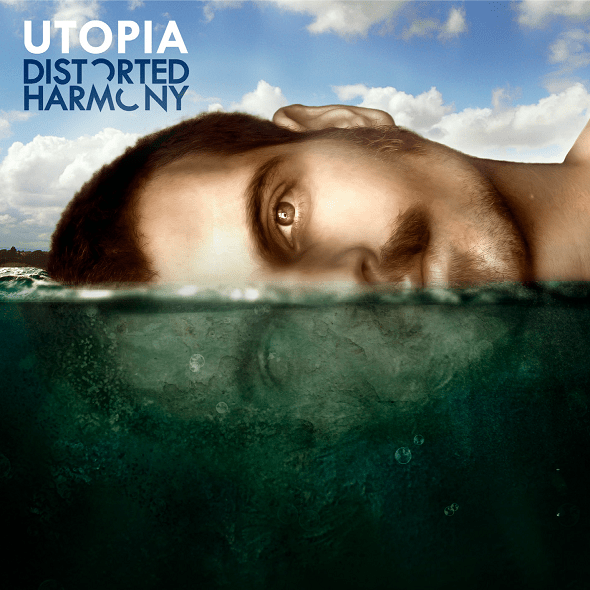 Distorted Harmony cite bands like Dream Theater, Opeth, and Symphony X as influences, and the styles of those bands are most certainly engrained in “Utopia”. I might add Pain of Salvation to that list. Although Dream Theater’s frantic, technical, oftimes quirky approach resonates most with Distorted Harmony, they are not so much a clone as they are taking that familiar style and going their own way with it. Most notably, “Utopia” is an incredibly melodic album, and I don’t mean in the bland AOR sense either. The album is filled with trademark instrumental prog metal passages, but Distorted Harmony set themselves apart most by combining melodic elements with prog so seamlessly. Misha Soukhinin is a perfect vocalist for this style; capable of a wide range, and able to capture a rich feeling at any pitch. Perhaps listeners will find Distorted Harmony too close in sound to Dream Theater, but repeated listens demonstrate how well these guys are able to fuse their influences into one glorious whole. I may be tempted to call it the “Aquarius” of 2012, in that “Utopia” is a surprise-out-of-nowhere prog metal debut. In truth however, they have taken this worn-and- weary style and done something that’s very much their own; rich, beautiful and proggy as hell. What’s even better; they’re offering it for free download on their website!